a nursing theme graduation party? Graduation is a special time where the pressures of school starts to slip away, and the grad gets to celebrate their accomplishment! It is perfectly fine to choose the traditional route when ordering party supplies to celebrate the culmination of nursing school (school colors, graduation caps), but consider getting creative with nursing and medical theme decorations, party favors, and invites. Here are our favorite ideas for planning a nursing school graduation party! June and July are busy months for parties... other graduations, weddings and summer BBQs. Ask your most important guests (Grandma, Grandpa, Aunts and Uncles) to check their calendars beforehand to make sure they will be able to be there. Consider an open house party where guests can come and go as they please. Open houses usually span over longer time periods, but it's a great way to accommodate different schedules! Invitations to a graduation party can also be mailed with graduation announcements (save a stamp)! 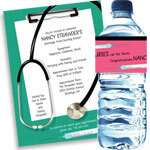 You're invited to celebrate Nancy's discharge from Nursing School! Nursing School Graduation Invitations - Just the thing to celebrate a new nursing grad. Choose from 3 "scrubs" inspired colors! EKG Nursing Invitations and Favors - Add a photo to this fun invitation to really show off your heartstopping/heartstarting nursing grad. 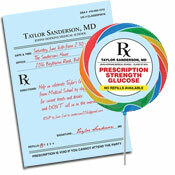 Prescription Pad RX Invitations and Favors - Clever and fun! Don't worry, your guests will be able to read the "handwriting" on this prescription to party. Scrubs and Stethoscopes Invitations and Favors - Nothing says new nurse in the house like green scrubs and the gleam of a new stethoscope. Customize with your wording! Graduation Color Photo Invitation - Perfect for a graduation party with a school color theme. Choose from 6 bright colors, customize the text, and add a photo! Custom Graduation Party Invitations - With many great themes to choose from, you will find the perfect invitation for your party! Graduation "Add a Face" Invitation - Male and Graduation "Add a Face" Invitation - Female - We add your grad's face to this fun invite, and you customize the wording. Very unique! Ticket Invitations - The perfect ticket to the hottest graduation party! Add a photo and choose your color. One of our most popular designs! Whether a graduation invitation or a graduation announcement we think it's a great idea to add some graduation confetti with every one you send out. Hang labeled body posters from a school supply store. Your grad may be too busy to greet every guest, so have a Nurse In Scrubs Lifesized Cutout waiting near the sign-in table. This stand up makes a great photo op, and you can even choose the grad's favorite color scrubs! Hang a personalized nursing graduation banner over your party entrance or sign-in table. 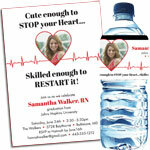 Customize with a special message from the new nurse! Graduation balloons in the grad's school colors add some interest to your space. Or choose red and white balloon bouquets (classic nursing colors), or balloons in the grad's favorite scrub colors. Place bouquets at party hotspots like the buffet, bar, and sign-in table. Fun idea... blow up latex gloves and add them to your bouquet! If you decide to make the party all about the graduate and want their photo everywhere, why not line the walk to the party with personalized graduation luminary bags? Guests will get a kick out of seeing the graduate's face as they walk into the party. A graduation scrubs sign in board is a classic way to let guests leave message to the grad. Match your invitations and favors to pull the theme through the entire event! Get a large foam board or canvas and attach a few pictures of the graduate with band-aids! Have guests sign the board around the pictures. Provide extra band-aids for creative expression. A guest book photo frame is also fun... guests sign the matte surrounding a picture of the grad on cap and gown or scrubs even! Make sure to buy smudge free markers. Have guests sign and leave well wishes on a pair of plain scrubs with fabric markers... wearable art! If you're inviting a few of the grad's classmates and instructors, have them write down "Nursing Words of Wisdom" on slips of paper. Collect them in a jar, and gift them to the grad to open after a long day at the hospital. Make a sign "Medical Transport Cooler" and tape it to the top of your drink cooler. 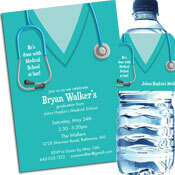 Add sodas and beers along with some water decorated with these nursing theme water bottle labels! Hand out surgical masks and plastic toys from doctor's kits for the guests to wear! Attach garland to a wall in the shape of an EKG test! Carry the EKG theme through to your deserts, too. It's easy to pipe an EKG reading on the top of a grad cake or heart cookies. Too cute! 2019 Glasses - These are not just for New Years and are also great for decorating your guests! Jello "Shots" (jello shooters in oral medical syringes). Serve chips and dip in a bed pan (a new one, of course). Make silverware bundles wrapped in a napkin and tied off with medical tape. Pieces from inexpensive kids' toy medical kits make great table decorations and cake toppers. Use disposable paper goods in red and white or the grad's scrubs colors. Layer two table cloths of different colors for a great look! Consider adding a clear tablecloth on top and then in between put pictures of the graduate as well as college memorabilia (football ticket stubs, old class schedules, concert programs, etc). Scatter bandaids and heart confetti for some fun table sprinkle! Personalized Centerpiece - Customize one of these centerpieces to match your invites, favors and party decorations! Tabletop Lanterns - Personalize one of these lanterns of the grad in their scrubs and add an LED candle to light it up! Stack the grad's nursing textbooks on each table and top with a classic red and white nursing cap. Such an easy centerpiece! Fill a basket or bucket with a bunch of medical supplies. Bandaids, gloves, gauze, pill bottles filled with candy, gloves, alcohol swabs, etc. Have a drawing or raffle, and winning guests get to take a centerpiece home! A cupcake stand with red and white cupcakes (add a nursing cap topper!) makes a great centerpiece and is super tasty, too! Of course, there's always nursing theme candy bars, lollipops, and cookies to keep everyone happy, too! Or have a nursing theme candy buffet! Set out glass vases and jars and fill each with one of these treats. Don't forget a small sign for each so guests get the joke! Hershey "Kisses for your Boo Boos"
Pull apart Twizzler "Clogged Arteries"
Have a fantastic graduation party, and congratulations to the new nurse from the Party Girl!